"1995 Park Hotel HB" by Monster4711 - Own work. "Börsenhof A - Bremen, Am Dom 5A - Durchgang" by Godewind (talk) - Own work. "Gewerbehaus Bremen" by Dr. Bernd Gross - Own work. "OsterholzerFriedhof 02" by Jürgen Howaldt - Own work. "Wohnhaus - Bremen, Oberneulander Landstrasse" by Godewind (talk) - Own work. 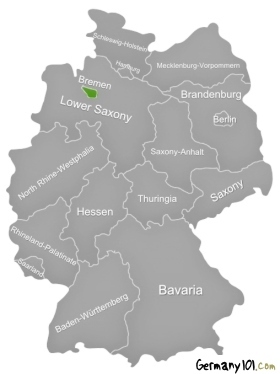 Bremen is the smallest state in Germany (together with Bremerhaven). Compared to the size of other regions in Germany, one might wonder whether this little state is worth a trip. You might be quite surprised about how much this little state has to offer. You could very well spend your whole holiday in Bremen without ever thinking that you wasted your time, especially if you have an interest in Hanseatic themes and medieval history. There are also lovely walks along rivers and creeks. 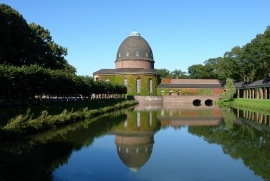 During the warmer months of the year, Bremen is a fantastic place for farm holidays, biking, hiking and enjoying locally produced, organic ice-creams. There are also festivals that are interesting to visitors, e.g. the Vision Parade in June, and the International Bremen Summer in August. In August, there is also usually a circus in Bremen (La Strada). Winter, however, also offers some great times for visitors. You can go ice-skating, and take in the traditional Christmas market around the city hall. In November, the international cutter race takes part on the Weser River, and in February it's time for the carnival (which has a more South-American feel to it than in other places in Germany). This is a part of the historic city center, and features many interesting historical buildings, i.e. old medieval buildings. 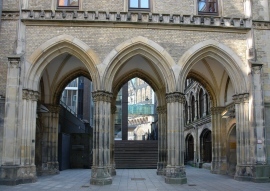 This area of Bremen is also the home of the Bremer Kunsthalle (museum of art). Lovers of art should not miss visiting this museum. This is quite a large park in the middle of Bremen. You can rent a boat to paddle on the various little rivers, there is mini golf, and of course a cafe and various ice-cream vendors. It's the perfect place for a relaxed day out (or just half a day if you don't have much time). 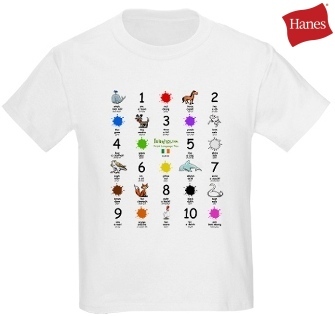 This is a great activity for a nice, sunny day. In summer, you will also see many people around the area of Osterdeich. They often have barbeques there (you could have one, too!). The river offers short and long walks, and you will have plenty of chances to watch birds (and people). 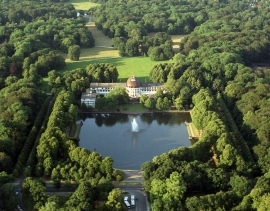 This part of Bremen shows off the agricultural nature of the small state. Greem fields, some soft rolling hills, cows, sheep, the clucking of chickens – it's all about pastoral romance in this area. This is a fantastic area for some cycling, and some of the farms sell the tastiest, organic ice-cream during the warmer months of the year. This town hall has made it on the UNESCO world heritage list, and is one of the most impressive town halls you will come across in Germany. There are tours of the interior, and they are highly recommended. The Town Musicians of Bremen are a quite famous story that is known to many people as they are part of the famous fairy tale by the Brothers Grimm (read the story if you have no clue what those musicians are). A very famous statue of the musicians is next to the city hall. It would be a shame to miss it during your visit to the town hall. You can also buy plenty of souvenirs with the town musicians of Bremen on them, and you will find the theme in many restaurants and shops. 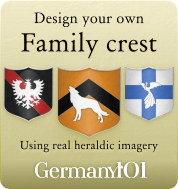 Knight Roland was the protector of trade, and plays an important role in many European towns, especially in Hanseatic towns. The statue of Knight Roland in Bremen can be found on the city's main square. The 1200 years old cathedral is a must for most visitors to Bremen and is hard to miss. It is huge and is located at the city's main square. It is a rather impressive building from the outside, but the inside is not any less impressive. If you are interested in Art Noveau, then you should definitely stroll down that street (from the main square). The whole street is kept in that style, and there is also a lovely Glockenspiel (ringing bells) in regular intervals. You will also find museums along the street. The Hilton has a wonderful staircase (but you'll have to stay there as a guest as this spiral staircase is not accessible to the public unless there is a special event). 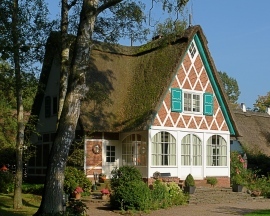 As Bremen is quite small, it is recommended to choose a fairly central place for your accommodation, then you have a good base to explore the state without always having to take your luggage with you. 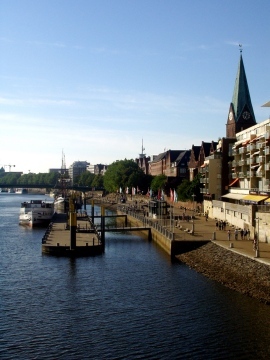 All parts of Bremen can easily be reached within a day, so choosing a central accommodation would be the best solution for you if you want to see everything but not move all your belongings all the time. Bremen can be busy during the festival season, so it is recommended to book your accommodation in advance.